Louis Youngblood was born on Valentines Day 1953 in Picayune, Miss; and grew up, for the most part, in Tylertown. His mother, Essie Mae, was a guitarist and singer of some note as was his grandfather, Arzo Youngblood. Both of them were heavily and directly influenced and taught by the renowned Tommy Johnson who was married to Essie Mae�s sister Rosa in the 30�s. Louis in turn was taught to play and sing by his mother and so indirectly picked up on Johnson�s style and still features songs by him today. When he was 16 Louis signed on to the �Jobs corps� where for three years he learnt to operate heavy machinery in Arizona and New Mexico and more importantly (for us) he joined a band and worked on his guitar skills. Upon leaving the corps Louis worked and lived around Jackson but regularly spent his weekends in New Orleans where his grandfather Arzo had relocated from Tyler to the 9th Ward. It was at the regular house parties given by his grandfather and his friends, who included the excellent Tommy Johnson devotee Boogie Bill Webb, that Louis would again hear the music taught him by his mother. It was during this time that the sound of Tommy Johnson was firmly bedded down into Louis subconscious. During these years Louis occasionally played in New Orleans with friends from home but it was in the 70�s in Jackson that he began to perform regularly with local bands at clubs and bars including Dorsey�s and The Queen of Hearts. Meanwhile during the day he was a lorry driver and heavy machine operator � hence the �Gearshifter� moniker. Blues in the late 70�s through to the end of the 90�s was hard to sell in Jackson and work became irregular. However, in the new millennium interest perked up and by 2003 he was working a residency with TC and the Midnighters at the E&E Lounge. The following year he switched to fronting the Delta Blues Boys at Monty�s Fine Dining every weekend. A couple of years later he found that carrying a band was fraught with difficulties and he decided to go solo and easily found work in the cafes and restaurants about town as an left-handed acoustic blues guitarist and singer. At this time Scott Barretta ex - Living Blues editor, heard him play and was so impressed that he produced a small � ragged but real � demo CD that contained a wonderful eclectic mix of pre-war and post-war blues together with soul blues classics that included a brilliantly humorous rendition of the salacious �Bang Bang on the Headboard�. On the back of this an intrepid Italian promoter booked him together with our old friend Terry Bean for a �Pasta and Blues festival�. At the same time we were in touch with Scott hoping to book Gearshifter for a Shakedown gig only to find that on his return from Italy he had been diagnosed with health problems that made flying impossible. Since then we have been in regular contact with Louis and have been following his recuperation closely. When we met Roger Stoller of Cat House Records at the George Brock concert in June he told us that Louis was playing regularly again and was looking and sounding fit and well. A �phone call with Louis confirmed this and he was happy to fly out at the beginning of November for a Shakedown date. 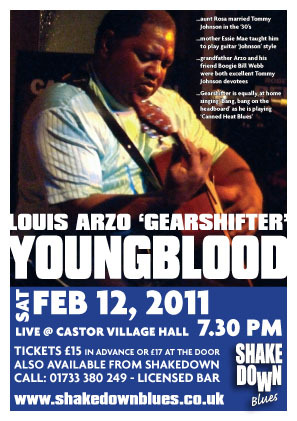 Since his exceptional almost five hour Shakedown gig three years ago Louis has been dogged by his health problems and the financial difficulties that ensue. When I tried to contact him a year ago for a return gig his telephones had all been disconnected and it was impossible to track him down. Having nothing to do on a hot summers day in July this year I phoned Roger Stoller of Cat Head Records who, in turn, got in touch with Scott Barretta, who spoke to a drummer, who, irregularly plays with Louis, who in turn sent me an email with Louis new telephone number. Five minutes later the gig was confirmed. Booking artists in Mississippi is easy when you know how! !